Polls are a great, interactive way to find out what your site’s visitors are thinking. They can be used for everything from serious market research to a little bit of fun. We’ve recently gone through A TON of free WordPress poll plugins to find some solutions for you. Many we came across simply didn’t work for one reason or another. These below were the seven that were left standing. If you know of any other good FREE polling plugins, let us know in the comments. The WP-Polls plugin is a clean and effective polling plugin. It lets you put polls into a widget, into a Post or a Page with a shortcode, and the author also conveniently shows you how to put polls into your theme’s template files with some code if you choose to. Here’s a look at what a poll in a widget looks like. And here’s a look at some of the styling options available. The Cardoza Poll plugin is a simple widget-based polling plugin that also allows for an archive of polls. Here’s a look at the poll widget in action. And here’s a partial look at some of the options. The Pinnion plugin runs off the Pinnion service, so you will need to register on their site. Essentially what this plugin does is bring the Pinnion poll-creation service into your Admin area. Here’s a look at a poll in action. 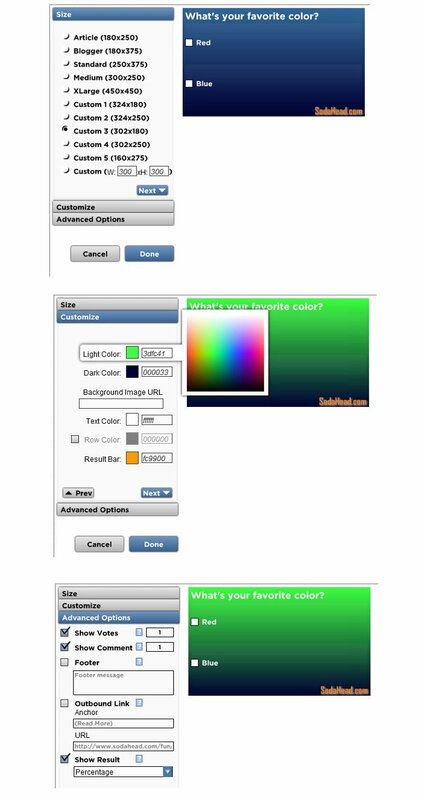 And here’s a look at the poll creation settings in the Admin area. The Addpoll plugn works through the Addpoll service. Like the Pinnion plugin, you will need to sign up for a free account in order to use the plugin. The Addpoll service offers a number of different styles to choose from. The Polldaddy plugin is tied into the Polldaddy service. You must first sign up for an account at Polldaddy in order for the plugin to work. In addition, with the free version you are limited to 200 survey responses per month and 10 questions per survey. The Polldaddy plugin offers twenty different styles that you can apply to your polls. Below you can see a few examples of the Question form and Result page for the related form. The Sodahead Polls plugin lets you style your poll form as you create it; however, the disadvantage to this plugin (or one of them at least) is that it doesn’t seem that you can go in an edit a poll (the content or the style) once it’s been created. And while it does give you some styling options, it doesn’t seem that a non-designer can make something that would look attractive very easily. Another disadvantage to this plugin is that it takes you to the Sodahead site in order to review the results. Here’s a look at some of the styling options. The Skysa Polls App puts a bar on the bottom of your site that visitors can click to answer a poll. You can also set new polls to pop up for the visitor. Here’a look at the bar at the bottom of the site, the pop-up poll, and the results window.